This post was written by Thea Kindschuh, Portland CRUX Coordinator. The project outlined is part of the Climate Resilience at Urban Campuses + Communities (CRUX) initiative. Social justice and climate resiliency are intricately connected. It is often the most vulnerable of our society that deal with the greatest negative impacts of climate change. 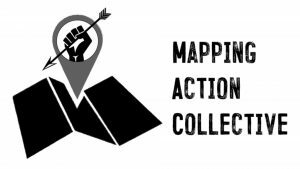 The Mapping Action Collective (MAC) works to reconcile this problem through “mapping for social justice,” which brings organization to large datasets dealing with insightful information to assist at-risk communities. MAC’s Community Asset Inventory data workflow is designed to help community groups increase both the quality and usability of their datasets. This blog post presents the data management workflow designed by MAC for the Portland, Oregon nonprofit Street Roots. Along with providing income opportunities and advocacy for people experiencing homelessness and poverty, Street Roots produces the bi-annual Rose City Resource Guide. The Rose City Resource compiles information on resources and services available in Portland for populations struggling with homelessness and poverty, including everything from legal services to food banks to public restrooms. 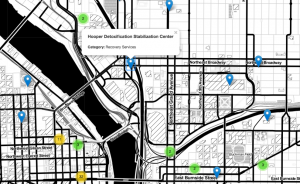 Street Roots partnered with MAC to structure the existing dataset of resources into an easily-maintained workflow hosted on the Northwest Open Data Exchange, where it is publicly accessible for use in any manner of applications and analyses. Further description of the collaboration between MAC and Street Roots can be found here. The digitized Rose City Resource is an interactive map showing where resources are distributed throughout Portland. The map will be regularly updated by Street Roots. The Rose City Resource has been a long-standing resource for the Portland area, putting relevant services directly into the hands of those that need them most via a hard copy pocket-sized booklet. By creating a structured data management system, this information can continually be updated. It can also be accessed by service providers looking to provide information or referrals without access to a booklet; by planners looking at social service distribution and gaps throughout the Portland area; or by organizations looking for assistance or collaboration potential with other service providers. Data workflow development was conducted in close communication with Street Roots staff, and is intended to adhere to data standards without increasing staff workload. To achieve this, workflows were oriented around existing systems with attention to what would be most useful for developing a useful application. Text blocks from the hard copy guide were structured into data fields within the AirTable workspace program, separating out queryable information such as category and contact information. This table (“Service Listings”), an additional table for phone numbers, and a Field Dictionary are all available here. To view a GeoJSON of the geographic spread of these resources, download and open this file in your browser window. For further information or updates, contact Thea Kindschuh (theak@pdx.edu) or MAC Co-Executive Director Tim Hitchins (tim@mappingaction.org).